Claudine Georgette Longet (born January 29, 1942) is a French singer, actress, dancer and recording artist who was popular during the 1960s and 1970s. 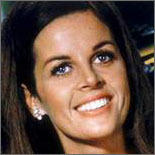 Born in Paris, France, Longet was married to pop singer Andy Williams from 1961 until 1975. She has maintained a private profile since 1977, following her conviction for misdemeanor negligent homicide in connection with the death of her boyfriend, former Olympic skier Spider Sabich.